Your pet door has two major parts: the frame and the flap. The frame sits in the cutout and may overlap with your door, sitting on top of it. The frame has two parts, the inside part and the outside part, that fit together to hold the flap in place. The flap is the part that covers the cut-out hole in the door. This is the part your pet goes through to use the door. Please note that all measurements are approximate and prone to user error, so don’t worry if you measure your door and your measurements aren’t exactly the same as the dimensions given online or in your manual. Your door’s dimensions will also change over time; doors expand and contract, and flaps may shrink or warp. Outer Frame: The outer measurements of the door’s frame. Framing out refers to using additional pieces of wood to install screws when installing the pet door into a wall or door panel. It's a useful technique when replacing an old pet door with a slightly smaller door. The Cut Out dimensions are furnished for your information. 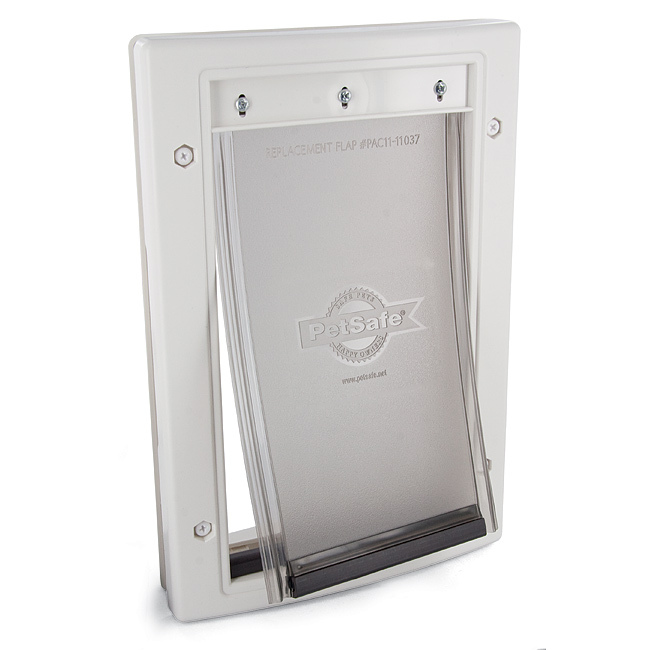 Always use the Pet Door cutting template included in the package before cutting an opening in your door or wall. Radio Systems Corporation shall not be liable for any personal injuries or property damage as a result of not using the proper Pet Door template when installing a Pet Door. 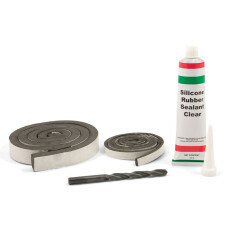 Small 5 1/4" x 8 1/8" 7 3/4" x 11 5/8" 5 7/8" x 9 3/4"
Medium 8 1/4" x 12 1/4" 10 3/4" x 15 5/8" 8 7/8" x 13 3/4"
Large 10 1/4" x 16 1/4" 12 3/4" x 19 5/8" 10 7/8" x 17 7/8"
Extra Large 13 3/4" x 23 3/4" 16 1/4" x 27 1/8" 14 3/8" x 25 1/4"
Small 5 1/8" x 8 1/4" 7 1/2" x 11" 6 3/8" x 10 1/8"
Medium 8 1/8" x 12 1/4" 10 1/2" x 15" 9 1/4" x 14"
Large 10 1/8" x 16 1/4" 12 1/2" x 19 3/4" 11 1/4" x 19"
Extra Large 13 5/8" x 23 5/8" 16" x 27 1/4" 14 7/8" x 26 1/2"
Small 5 1/4" x 7 1/2" 9 1/4" x 13" 6 3/8" x 10 1/16" 6 3/4" x 10 5/8"
Medium 8 1/4" x 11 1/4" 12 1/4" x 17 1/8" 9 9/16" x 14 5/16" 9 7/8" x 14 3/4"
Large 10 3/8" x 15 3/8" 14 1/4" x 21 1/16" 11 7/16 x 18 1/8" 12 x 18 7/8"
Medium 8 1/8" x 12 1/4" 10 1/2" x 15" 9 3/8" x 14"
Large 10 1/8" x 16 1/4" 12 1/2" x 19 7/8" 11 3/8" x 19"
Small 7 1/8" x 8 1/4" 11 3/4" x 15" 10 11/16" x 12 1/8"
Medium 9 5/8" x 13 1/4" 14 1/4" x 20" 13 1/8" x 17 1/16"
Small 5 1/2" x 7 7/8" 9" x 15 5/8" 8 3/8" x 14 3/4"
Large 11" x 16" 16 1/8" x 23 5/8" 15 5/8" x 23 1/4"
Big Cat (PPA00-11326, 280US) 7 1/8" x 7 15/16" 11 3/8" x 11 3/8" 9" x 9 1/4"
Deluxe 4-Way Locking (PPA00-11325, 919US) 5 1/2" x 6 1/8" 7 1/2" x 8 1/8" 6 3/16" x 6 7/8"
Magnetic Door (PPA00-11324, 400 Series) 6" x 5 1/8" 9 1/2" x 10" 6 1/2" x 6 3/4"
2-Way Locking (CC10-050-11, CD10-050-11) 5 3/4" x 5 3/4" 7 1/2" x 7 7/8" 6 9/16" x 6 13/16"
4-Way Locking Cat Flap (P1-4W-11, S1-4W-11) 5 3/4" x 5 3/4" 7 1/2" x 8" 6 1/2" x 7"
8" x 9 1/4" 9 7/16" x 11 7/16"
Small 5 1/4" x 8 3/16" 8 1/2" 1 3/4"
Medium 8 1/4” x 13 3/16” 11 1/2" 1 3/4"
Large 10 1/4” x 16 3/8” 13 1/2" 4 1/4"
Large Tall 10 1/4” x 16 3/8” 13 1/2" 8 1/4"
Medium 8 1/4" x 13 3/16" 11 1/2" 1 3/4"
Small 5" x 7" 7 3/4" x 10 3/4" 5 13/16" x 9 1/2"
Medium 8" x 11" 10 3/4" x 14 3/4" 8 11/16" x 13 1/2"
Large 10" x 15" 12 3/4" x 18 3/4" 10 11/16" x 17 1/2"
Extra Large 13 3/8" x 23" 16 1/4" x 27 1/4" 14 3/16" x 25 5/8"
Small 4 1/4" x 7" 6 3/4" x 9 3/4" 5 5/16" x 8 1/8"
Medium 8" x 11" 12 1/8" x 17 1/2" 10 3/4" x 14 3/4"
Large 10 1/2" x 15 1/2" 15 3/4" x 23 1/4" 13 3/4" x 19 3/8"
Small 4 1/4" x 7" 8 1/4" x 11" 7 7/16" x 10 1/4"
Medium 8" x 11 1/2" 12 3/4" x 16 7/16" 11 15/16" x 15 5/8"
Large 10 3/8" x 15 3/4" 15 1/2" x 21" 14 5/8" x 20"
Extra Large 13" x 18" 18 3/4" x 27 1/4" 17 15/16" x 22 5/8"
Small 4 1/4" x 7" 8 1/4" x 11 9/16" 6 1/2" x 8 3/4"
Medium 8" x 11 1/2" 13 1/4" x 17 1/4" 10 3/4" x 14"
Large 10 3/8" x 15 3/4" 16 1/4" x 21 1/2" 13 3/4" x 18 1/4"
I have a discontinued or older model pet door and want to replace it with a different pet door. It can be difficult to find a pet door that will match your old one exactly. First, you'll need to measure the cutout hole in your door. Note that this is the cutout in the door, not the pet door frame. Next, pick a door that is closest in measurement. 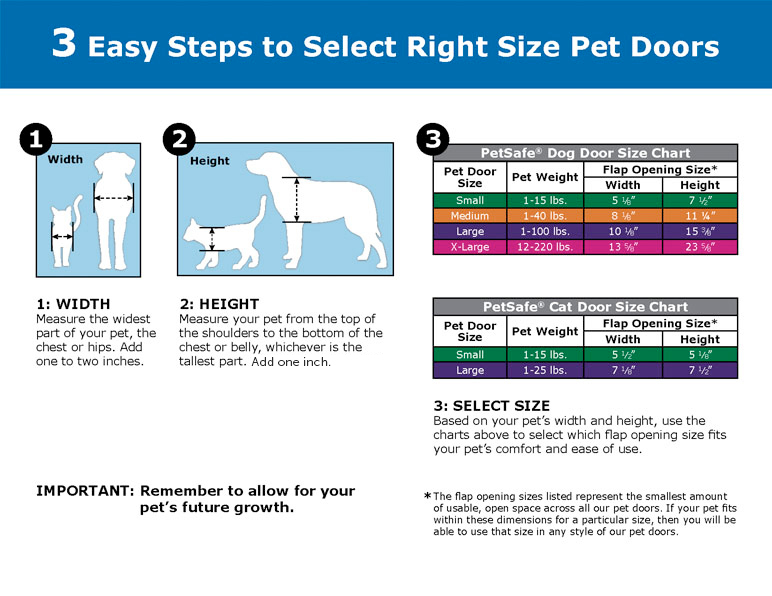 You can find the dimensions for our pet doors in this chart. How do I replace the flap? Because of the way our cat doors, electronic doors, and screen door are designed, flaps aren't available separately and can't be replaced. If your flap breaks, you will need to purchase and install a new door. We apologize for any inconvenience. What’s the difference between a cat door and other pet doors? Though small dogs can use cat doors, these doors are designed specifically for cats. Cat doors are designed with wider frames and hard, see-through flaps. Cats like being able to see where they’re going, so transparent flaps make them feel safer using the door. Soft door flaps drag along your cat’s back when she’s going through the door. Hard flaps are easier for cats to push through and don’t touch their backs as much. Cats also have proportionally wider bodies than dogs. Standard pet doors tend to be tall and narrow, while cat doors are wider and more square. Can I buy a clear/see-through replacement flap? We're sorry, but we don't offer translucent or see-through flaps. 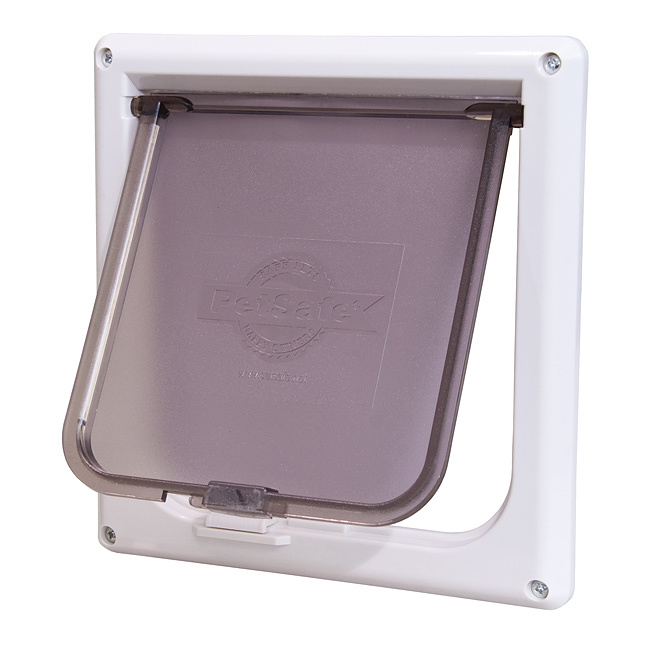 You can find the right flap for your door using our Door Flap Finder. If your pet has trouble going through the tinted flap, you may need to encourage your pet with these easy pet door training steps. How do I train my pet to use the pet door? Most pets will learn to use the door with a few short training sessions. However, some pets can take a little longer to become comfortable and more confident using the door. The most important rule is to be patient with your pet. Let your pet work out for himself that he can go through the pet door. With a little patience and training, you and your pet will soon enjoy the freedom your new pet door provides. Helpful Tip: Try treats or toys to encourage your pet to go through the pet door. Lift and hold or tape the flap open using string to help your pet become familiar with the pet door opening. MAKE SURE TAPED FLAP IS SECURE AND WILL NOT FALL DURING TRAINING. Try to encourage your pet to come through the pet door. DO NOT FORCE your pet through the door or they may become frightened. Give your pet motivation to use the door, such as to reach food. First, feed your pet close to the pet door on the inside. Once your pet is comfortable approaching the door, move food to the other side to try to get your pet to go through the door. After your pet has used the pet door a few times, hold the flaps open and try to get your pet to go through door while gently lowering flaps so the flap touches your pet’s back. This will help your pet become familiar with the flap. Encourage your pet to push through the flap on his own.